After spending much of the winter fastened to my trainer and working out in the gym, I am finally getting outside onto dry roads and spring-like weather. As the leaves bud and flowers bloom, with temperatures in the mid-teens (Celsius), I’m rediscovering the magic of riding outdoors and gasp! turning and cornering. In preparation for these rides, and an overall fulfilling and enjoyable cycling season, not only am I aiming to ride 100 – 200 km per week (and taking Fridays off from June thru August, as I did last year), but I’ve signed up for fitness assessments and subsequent coaching and an individual training plan from Peak Centre for Human Performance. My “goals” although not specific, are to shed the remaining tummy tire I currently have; become a better cyclist (in terms of technique, strength, results and enjoyment), and ultimately become the best cyclist I can be. Not only do I want to get stronger (both increasing my power and my endurance), I also want to get to know my body better – my limits – and better manage energy and output during rides. I want to be more in tune with my performance so I can be a better tactician: conserving where necessary and plan attacks, rather than arriving at finish lines barely hanging on. I’ve been told during various consultations with Peak employees that this is exactly the service they provide. I did my initial fitness pre-assessment last weekend – comprised of hooking my bike to a trainer, hooking that up to a CompuTrainer resistance unit, then hooking myself up to a helmet-mounted snorkel with a nose clip. Breathing only through my mouth, and thus only through the snorkel, the technicians are able to measure my breathing as well as the efficiency with which I use oxygen (VO2 Max). I pedal at a consistent cadence (90 RPM) and every 3 minutes the resistance is increased by 30 watts. Furthermore, my heart rate and breathing are monitored (to measure my aerobic threshold) and at every 3 minute interval blood is taken to measure my lactate threshold. This data will be interpreted by my coach, strengths and weaknesses will be learned, and a specific training program will be crafted to help me focus on areas of improvement. 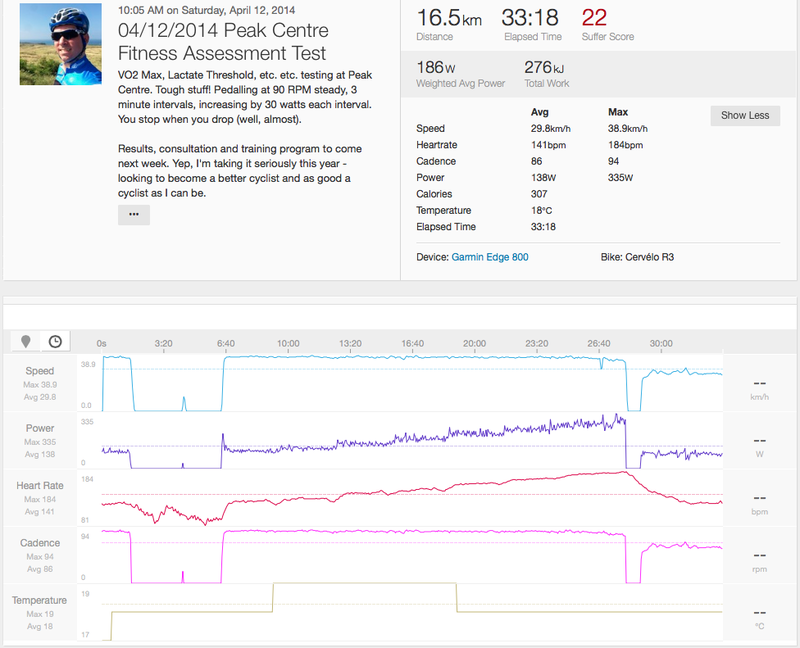 And although in my mind I felt like it was easy-going for quite a while and then suddenly got hard, my personal computer data (which you will see below) shows a very gradual increase in heart rate and power, before I crashed. Initial lay-person’s look at my test results show that I’m horribly average. I maxed out at approximately 3/4 of my potential aerobic power (given my age, size, etc.) – thus my fitness does not coincide with my ability. Not surprising I suppose, considering this is only my second year of cycling, but still, a bit deflating. However that’s why I’m doing this program, and improving is my main motivation. Stay tuned for details on my coaching and training program! Very interesting. Good luck with this.